Prior to the Senate Intelligence Committee's vote on CIA director nominee John Brennan to move to a full Senate vote, the Obama administration provided much of the information the Senate Intelligence Committee had been requesting for five months regarding the Sept. 11, 2012 attack on the U.S consulate in Benghazi, Libya, CBS News has learned. The documents are voluminous and both Republicans and Democrats on the committee had the opportunity to review them. Documents provided include emails regarding "who changed the Benghazi talking points" and many communications between officials in Libya and Washington, D.C., leading up to and during the attack. Regarding the talking points: one source who reviewed the documents said removal of the word "al Qaeda" from the talking points was initiated, at least in part, by one of the "press shops." The source said press officers from the Defense Intelligence Agency, the White House and the FBI were "looped in" from the start and that some of them expressed concerns in writing that the media would ask follow up questions if certain words or phrases were used. The source added that the Director of National Intelligence James Clapper and then-Deputy CIA Director Michael Morell were included in these emails. When asked whether Clapper and Morell misled Congress when they didn't disclose who changed the talking points (because they knew), one source said "the exact right question wasn't asked." A DNI spokesman acknowledged that press officers from his agency and other agencies were looped in and took part in the talking points exchanges, but he said "no press officers suggested the edits of the specific words 'al Qaeda.'" "People who could make such edits were subject matter experts," the spokesman said. He declined to say who those people were or what other edits the press officers may have suggested. The spokesman added that Clapper "received the talking points after coordination among the press officers and other groups in the intelligence community." The documents viewed by the intelligence committee members indicated numerous other changes were made to the talking points, including removal of certain references to an "attack." 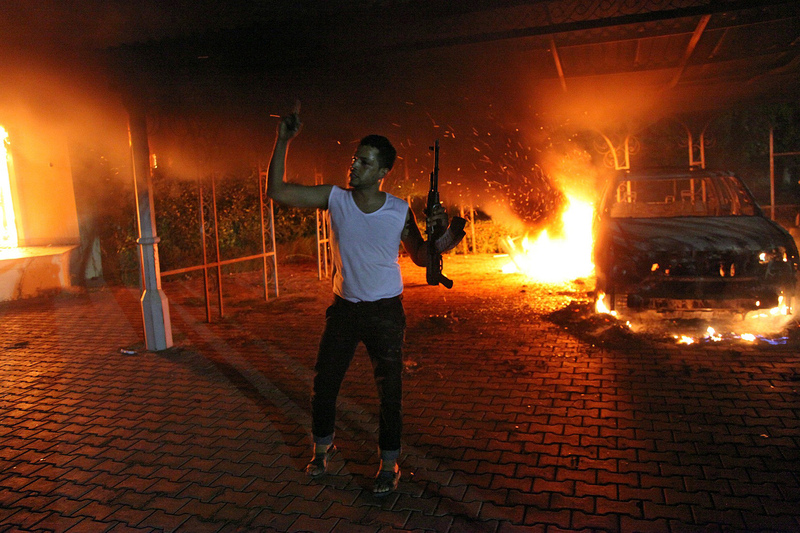 The source who reviewed the documents also flagged several emails prior to the Benghazi attacks from officials in Libya to Washington, D.C., that supposedly specifically warned of an imminent attack within days of the Benghazi consulate. Additionally, the source says "most if not all contact" between officials in Libya and Washington, D.C., once the attacks began reference al Qaeda, al Qaeda-affiliated cells or both as being the suspected instigator from the very start. The few references to demonstrations were by people who hadn't directly observed any. "It's amazing that anyone would question who was behind the attack and keep the idea of the demonstration going for weeks," said the source. Brennan sailed through the committee vote today, 12-3, after committee members were able to review the Benghazi documents along with information relating to the administration's drone policies - two issues that held up a vote on his nomination. "It was unfortunate these issues delayed the process, but I am confident that they have been resolved," committee chairman Sen. Dianne Feinstein, D-Calif., said in a statement. Feinstein said later she expects Brennan to get the 60 votes of support needed to break a filibuster. However, Sens. John McCain, R-Ariz., and Sen. Lindsey Graham, R-S.C., have vowed to block a full vote on Brennan until their questions on Benghazi, drones and other issues are answered. McCain's office said Tuesday night that since he's not on the committee, McCain was not able to view the documents and indicated he's still awaiting answers to questions he posed to Brennan last month.